This recipe may or may not have led to my first incident of theft. Theft is probably too strong a word, it was more like…pilfering. In any case, I spotted this in an old issue of Sunset magazine at the gym last winter, and it stopped me dead in my (elliptical machine) tracks. I briefly considered coughing and ripping the page out, then decided that was probably even more uncouth, and just took the whole darn thing. I don’t know why I felt so guilty about it; I’m pretty sure those magazines are there for the taking. Still, I snuck it under my jacket lest anyone try to stop me on the way out. I was NOT GOING HOME WITHOUT THIS RECIPE. 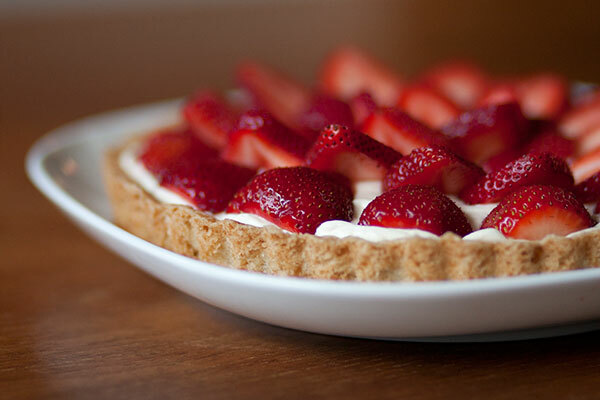 It was everything my summer-starved mind was craving: fresh berries, a light, creamy filling with just enough crème fraîche to give it a bit of tartness and character, and a buttery, crumbly crust more akin to a shortbread cookie than a pie crust. 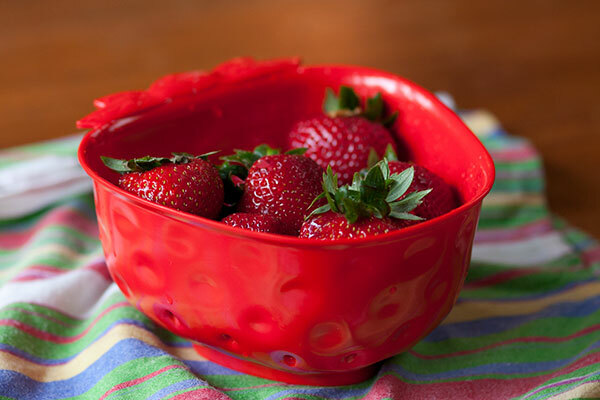 It doesn't hurt that it comes together ridiculously quickly and easily, and if you take the few extra moments required to arrange your strawberries in concentric circles with cut sides alternating up and down, you’ll breeze into that summer barbecue looking like a culinary wizard. Surely that's worth a little light pilfering. Note: This recipe would be delicious with all manner of fruits: blueberries, raspberries, peaches, heck, even cherries if you can be bothered to pit and slice them. Promise me you'll try it with strawberries first though, and do it soon while they're at the pinnacle of juicy-sweet-red-ripe-perfection. You won't be sorry. Bake until edges are just golden, 20-22 minutes. Let cool on a rack, then carefully push crust from pan rim and set on a plate. In a medium bowl, beat crème fraîche, whipping cream, remaining 2 Tbsp. sugar, and remaining 1/2 tsp. vanilla on high speed until thick. Spread in cooled crust. 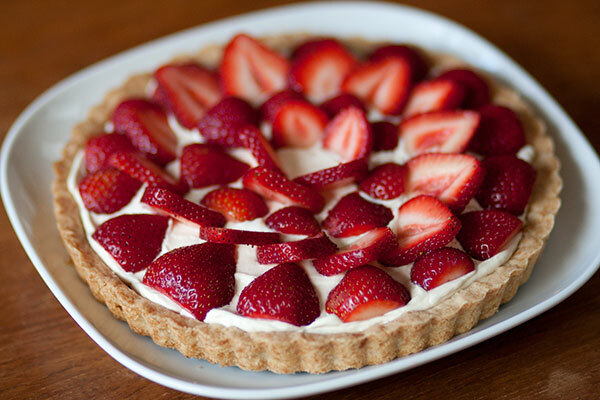 Arrange strawberries in concentric circles, alternating cut sides up and down. I briefly considered straining and heating some strawberry jam to use as a glaze, but was so glad I opted not to- it is just perfect the way it is, and I fear a glaze would make it cloyingly sweet. Might be worth considering if your fruit is not particularly sweet or flavorful, however. Can be made up to 4 hours ahead, and stored, loosely covered, in the refrigerator. 1. Cafe Capris 2. Polka Dot Blouse (there's this one and this one too- super cute and a great price!) 3. 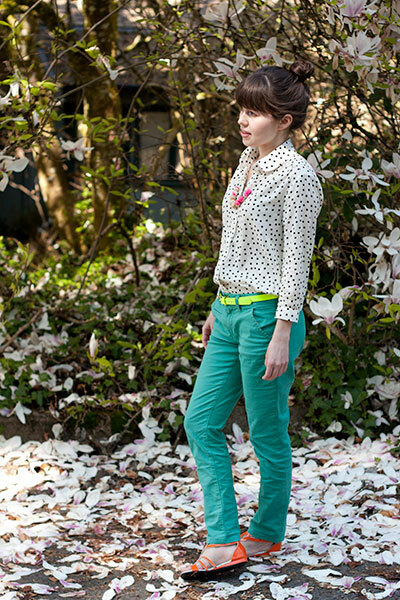 Audra Patent Sandals 4. Neon Skinny Belt (and here's another one) 5. 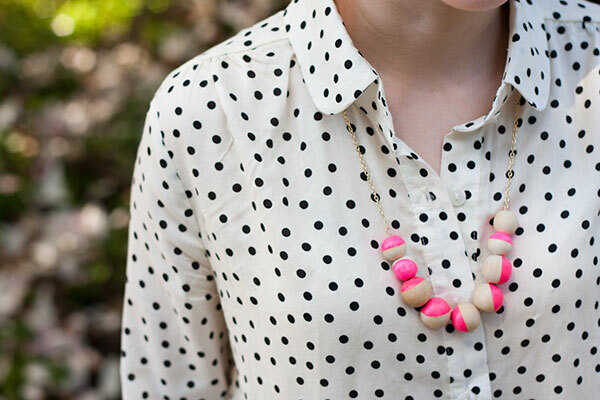 Neon Pink Colorblock Necklace- available in my shop soon! I don't know about you, but it's looking like I'm gonna ride the neon bandwagon into the sunset- I just can't get enough! 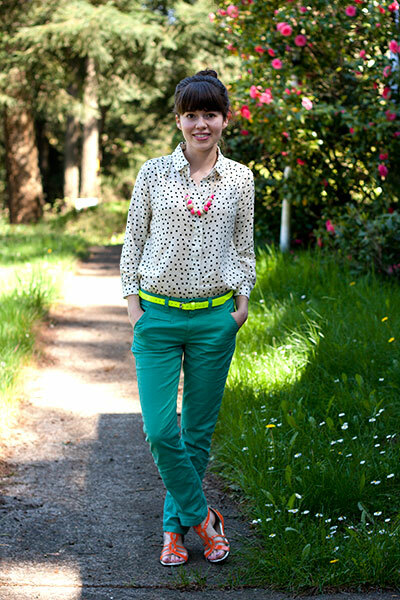 Every time I get dressed, I end up adding a neon necklace, a belt, shoes...something to give it a little pop. Fortunately, the other color that seems to be ever-present in my wardrobe is gray, so I don't walk around looking too much like a pack of Skittles. What about you? 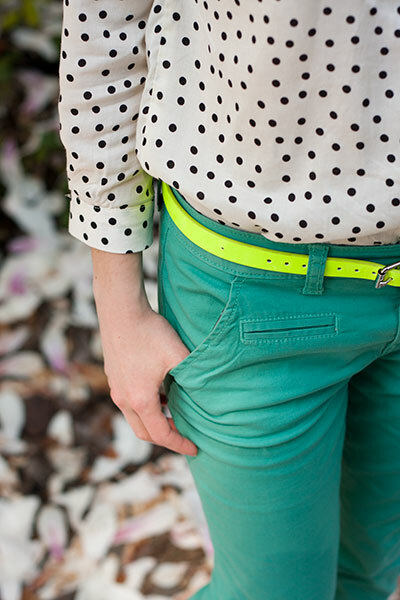 Are you still loving the neon trend for summer, or are you over it? What are your favorites? 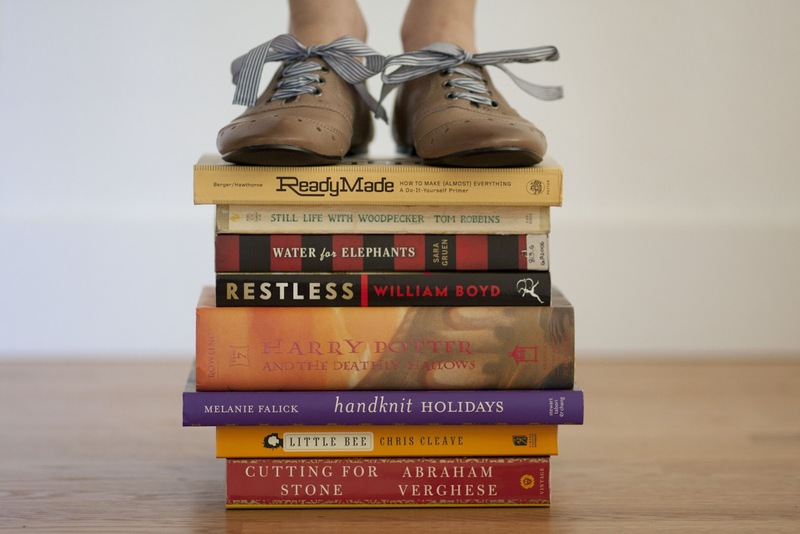 I kept a journal of the first lines of all the books I read for a while- such a fun way to remember them! P.S.I have a friend who reads the ends of books before she starts them!! This is tantamount to sacrilege in my book. Would you dare? For you shoe-a-holics out there (guilty), my shoes are a kids' oxford from Nordstrom, but here's an almost identical adult version for those who aren't quite so wee-of-foot.